Chris Patmore and his wife Robin run a 4000-head sheep enterprise 20km north of Eneabba, 300km north of Perth. “I've got four properties around the place that require remote monitoring. To make life a bit simple for me about six years ago I invested in a remote monitoring outfit with 15 cameras. It allows me to do other things around the farm that probably wouldn't be getting done while I'm wasting time driving around checking troughs. So my farm improvement program has taken a step up. Fencing and Lane Ways and that sort of stuff. It's proved itself well and truly over the years. It allows me to leave the sheep without physically checking them and I can just check them on the phone. We run about 4000 ewes here and it's not a big job to check them when their close by but when they're a fair distance from home it does create logistical problems. The uSee Remote Monitoring setup is well and truly worth it and I'd recommend it to anyone that is running sheep that is any distant from home at all. I've modified them to make them portable just with a thumbscrew, and just unscrew them and lift them off and take them with you and throw them in the back seat of the vehicle and off you go. When you shift a mob of sheep you shift the camera with the sheep. 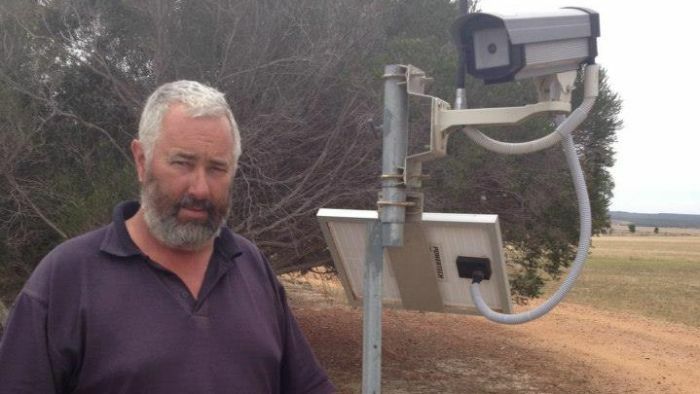 Peter Roe is an Agricultural Economist that has been working in the field for over 20 years and has investigated the economics of the uSee Cameras for Chris. “Chris has managed to save over $23,000 a year. So for each dollar Chris has invested in the system across a 10 year life of the system, he's saving himself $5.30. That's $5.30 a combination of both labour and reduced fuel and wear on the vehicles.